In honor of National Heart Health Month, I hope you will take a moment and think about your ticker. Think about how much money you spend on food that gunks it up. And how much money you’d spend on surgeries to ungunk it. And how cheap a bag of beans is, or a bag of bulk organic oatmeal. You can put money in your pocket over the long haul, lots of it, and have a ticker that keeps on ticking into your Georgia O-Keefe years, OR you can have that triple-cheese, double-meat, mayo-on-a-sawdust-bun contrivance from a fast food hamburger joint that, let’s face it, probably makes you feel like poo after you eat it. 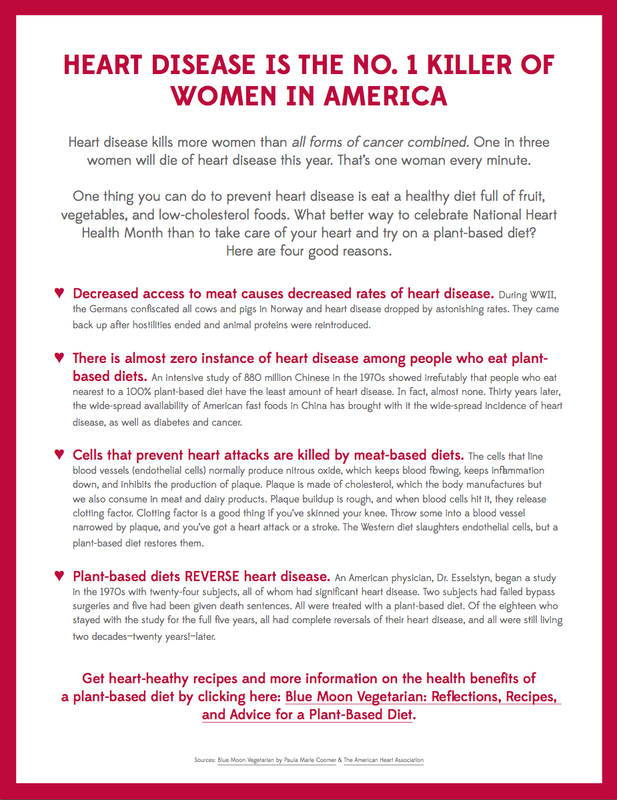 This year, one woman per minute will die of heart disease. ONE PER MINUTE. And click on the buttons at the bottom of this post to share the message (and please do!) with those you love who have heart disease, or are at high risk for heart disease. Even cutting back on meat a little bit helps. I took up the challenge to get my heart into shape four years ago. I have a family history of heart disease, cancer, and diabetes–the three major causes of death in the U.S. 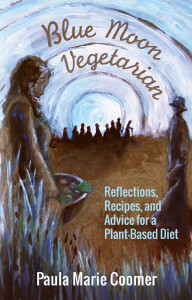 In other words, I’ve been there, and I wrote a book while making the change to improve my health. If you want to get my heart-healthy recipes and learn more about how you can improve your odds by switching to a plant-based diet, check out Blue Moon Vegetarian: Reflections, Recipes, and Advice for a Plant-Based Diet.